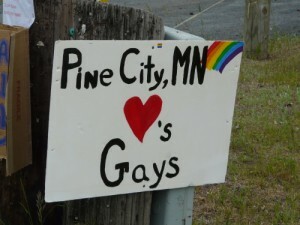 Every first Sunday in June, Pine City plays host to one of the few rural LGBTQ Pride festivals in America, and each year it gets a little bigger. For 2017, the festival has booked Kat Perkins, a semifinalist on NBC’s The Voice. Perkins will be performing a Sia tribute. Joining her will be Mark Joseph and The American Soul, a regional blues and soul favorite. Twin Cities Public Television’s Val Mondor will serve as emcee. According to organizers, the event will be an alcohol and tobacco free event with music, food, and art activities for children. East Central Minnesota Pride happens with the help of volunteers and groups like East Central MN Men’s Circle, East Central MN Purple Circle, East Central MN chapter of PFLAG, Rural Aids Action Network, Rainbow Health Initiative and OutFront Minnesota. East Central Minnesota Pride is on Sunday, June 4 from noon to 5pm at Robinson Park in the heart of Pine City. Good job Pine City Pride and Kay Perkins! It was a great day and Kat Perkins was fabulous! I was a vendor and had a lovely day!